This post describes an approach for getting started with TeamSense in a way that is aligned with its three core values of Respect, Individual Development and Team Performance. The first step is to establish some important up-front agreements. Doing this as a team draws on everyone's experience, gives people the opportunity to raise any concerns and gives the team ownership of their Performance Management process. 1. What competencies do we value? Answering this question is a very valuable exercise in itself. It begins a team dialog on competencies, bringing people to a common understanding of what a particular competency means and looks like in the team setting. TeamSense comes with a bunch of predefined competencies, which the team can customise or add their own. The competencies are expressed as a short heading, a brief description and a list of example behaviours. To help this discussion one can use a deck of cards, each one with a competency name, description on the front and the example behaviours on the back. Teammates can pass them around, talk about their relevance to the team and ultimately select the ones they think most important. In addition there should be some blank cards, to allow the team to come up with their own competencies as they wish. These cards are available here for you to use. 2. How frequently are we going to exchange ratings and feedback? Having determined the competencies that matter, now the team need to agree how often they are going to exchange ratings and discuss their feedback. There are lots of options, from every 4 weeks through to every 3 months. 80% of participants each take less than half an hour to exchange ratings. This makes more frequent reviews a viable proposition. 3. Who are we going to discuss our feedback with? Being able to discuss the feedback is very important. The options available depends very much on the culture of your organisation. In more traditional environments where people are used to Performance Reviews people may readily agree to sharing their feedback with their Line Manager. This is aligned with the Respect principle, as long as the Line Manager commits to sharing the feedback they received from the team with their Line Manager. Of course, more progressive organisations have more creative options. For example an HR consultant can serve as the team's moderator. Their role is to support the team members in understanding and realising any recommendation they are given. Being external to the team, an HR moderator is well placed and appropriately skilled to do this as well as mediate between team members in conflict. 4. When will we review these agreements? 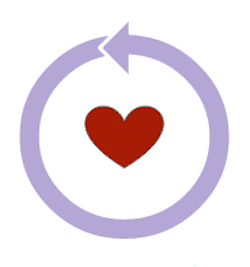 It is important to continuously apply the learning from previous review cycles. Just like any other activity, this one needs to be regularly inspected and adapted to ensure that it is still of value to the team. Having decided the review cadence, the team can decide how many reviews to have before re-examining all of these agreements. It could be that the team may want to focus on different competencies, adjust the frequency of the reviews or find more helpful ways of discussing the feedback. If the team is very stable and ratings and feedback are very positive you might want to reduce the frequency or experiment with more specific competencies e.g. domain knowledge or technical expertise. To get the most value from TeamSense, it should be used in a way that is aligned with its values and principles. A good way to begin is with a team discussion, the goal of which is to agree the competencies, cadence, conversations and retrospection. 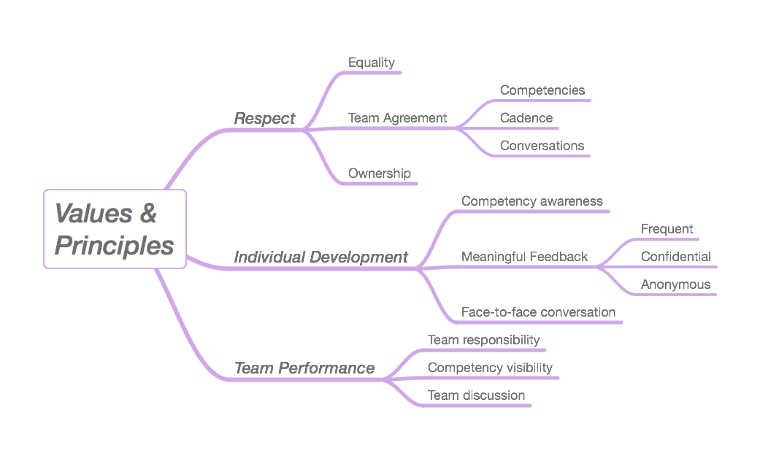 Talking about the competencies valued by the team is a useful exercise in its own right. To really understand what TeamSense is all about, a good place to start is with its three core values and the principles that flow from them. Not only are these principles deeply embedded, they serve to inform how the tool can be applied in different situations. As TeamSense is the team's tool, establishing how to use it is best done through team discussion and agreement. The team determine the competencies that are of value to them, the cadence at which feedback will be exchanged and the conversations that will happen during and at the end of each feedback cycle. This is more respectful than dictating how the tool will be used. It also enables the team members to reciprocate respect by agreeing to be bound by the team's agreements. The principle of ownership gives team members full control over their ratings and feedback. Nobody can access this data unless the individual explicitly shares it with them. This prevents the situation where people's performance feedback is being accessed without their knowledge for purposes other than personal and professional development. Whether we see personal development and growth as a purpose in itself, there is no doubt that a deeper understanding of our behaviours can be of great personal benefit. Professional development enables us to have successful careers, and though this is no guarantee of happiness, it can certainly make life a lot easier. Taking a moment to recognise that we are all on a journey helps us to see our current state of being in context and to move forwards. Receiving feedback is one thing, but really learning from it is another. The best aid to this is to discuss it in an informal setting with someone we trust. How this happens forms part of the team agreements mentioned previously and will vary depending on the constraints imposed by an organisation's culture. Options might include one-to-ones with a Line Manager or some other trusted individual. In more progressive organisations this could be an HR person external to the team. They would act as the team's feedback moderator, supporting team members in understanding and realising the recommendations they receive. If necessary they can also serve to mediate between team members in conflict. Wanting people to have the opportunity to develop and grow isn't just a noble goal. It is an important factor in enhancing the performance of the team. Appropriately anonymised charts make the team's competencies visible in a way that is about the competencies, not the individuals. It raises awareness and provides a way into team discussion about how they can improve. Unlike traditional approaches to Performance Management, TeamSense is founded on respectful and team centric values and principles. 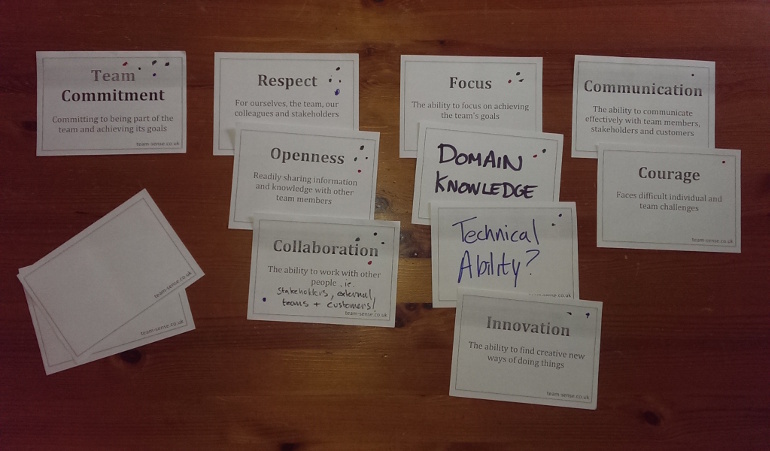 These values are aligned with those of Agile and Lean, making TeamSense a good fit for Agile teams.